EWTON - The processional of altar servers, scripture readers, deacons, and priests that opens a Roman Catholic Mass is generally a solemn ritual, as the Cross and the Scriptures are carried to the altar for the beginning of the service. Yet Monsignor Michael Smith Foster's walk up the center aisle of Newton's Sacred Heart Parish yesterday - a return to his favorite parish after being cleared of sexual abuse allegations - looked more like a victory lap. Wearing cream vestments trimmed in green and gold and a broad smile, Foster, the 47-year-old chief canon lawyer for the Archdiocese of Boston, was besieged by hands reaching to shake his as he made his way toward the altar. At the halfway point, the handshake of one silver-haired woman quickly became a bear hug as she yanked him closer. About 10 rows before he reached the sanctuary, the 300-plus parishioners broke out in spontaneous cheers and applause that widened Foster's already huge smile. In less than three months starting last summer, Foster was suspended from the priesthood over allegations that he molested former Newton teenager Paul R. Edwards, reinstated as the Boston Globe and Edwards's own lawyer raised doubts about his credibility and facts contradicting his allegations, suspended again after Edwards renewed his charges, and reinstated again on Oct. 30. Foster thanked God, the Virgin Mary ''for her protection,'' the saints who inspired him during his 76-day ordeal, as well as his family, his friends, and his fellow priests for their support. He also singled out one group in particular, moving up the traditional exchange of greetings of peace from the end of the Mass to the beginning, so he could go out in the aisles and hug some former members of his Sacred Heart youth groups from the 1980s. Members of the group were instrumental in contradicting Edward's allegations. Among the former youth group members was Linda Amicamigioli, who met Foster when she was 12. Now living in London, Amicamigioli said she heard about the allegations against Foster and began bringing other former youth group members from Sacred Heart back in contact with each other. Amicamigioli said her feeling yesterday was one of ''absolute joy'' - a sentiment shared by other current and former parishioners. 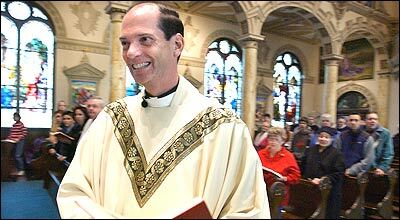 Goff said many parishioners believed the allegations were mishandled by the archidocese. Archdiocesan spokeswoman Donna Morrissey said church officials are doing ''the best they can'' dealing with a flood of allegations of sexual abuse by priests. Foster said he wanted to continue to have a role, but not as a ''poster boy'' for wrongfully accused priests. ''I hope I can take from both my knowledge of canon law and from my experience [being falsely accused] and offer my advice,'' he said. Foster also said he is not looking for an apology from the archdiocese because the focus needed to remain on the ''true victims,'' the victims of child abuse. A friend who helped Foster celebrate the Mass, the Rev. Gerald Perno, said the mood of many other priests yesterday was of tempered joy: happiness that Foster had been cleared, but sadness both for the victims of sexual assault by priests and for other wrongly accused priests. This story ran on page B1 of the Boston Globe on 11/25/2002.